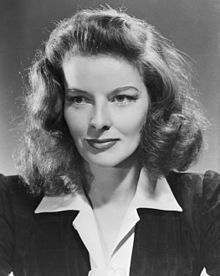 Katharine Hepburn (May 12, 1907 - June 29, 2003) was an American actress. Her career lasted 66 years. She is thought of as one of the top screen actresses in movie history. She was nominated for 12 Academy Awards, winning four. Hepburn was born in Hartford, Connecticut and went to Bryn Mawr College. She got her degree in 1928 and started on Broadway that same year. In 1932 she got a role in the George Cukor movie A Bill of Divorcement, with John Barrymore. She was very successful in the early 1930s, but then she became unpopular. She became popular again with the movie The Philadelphia Story. In 1942 she starred in Woman of the Year with Spencer Tracy. They made eight more movies together, including Adam's Rib and Guess Who's Coming to Dinner. They also had an off-screen romance that lasted until Tracy's death in 1967, but they never married because Tracy did not want to divorce his wife. Before this, Hepburn was married to Ludlow Ogden Smith from 1928-1934, and also had relationships with Leland Hayward and Howard Hughes. Her autobiography, Me: Stories of My Life, came out in 1991. She died on June 29, 2003 at 2:50 p.m., at Fenwick, the Hepburn family home, in Old Saybrook, Connecticut. She was 96.